I don’t remember in which year of the war in Iraq that conversation took place. The stories from Arlington West all run together after a while. Those who worked on the project had their hearts broken over and over, watching and listening as young (and some not so young) Marines took advantage of a rare opportunity to give voice to their feelings. There were others, too, not just Marines, representatives of all the uniformed services, and family members. Many family members. Shortly after the US invaded Iraq, Jim Brown, a member of San Diego Veterans for piece, put together several hundred small wooden crosses, and with a few friends, took them to Oceanside, where they placed them in neat rows along the beach. Each cross bore the name of an American killed in the fighting. The group, outraged at the lies, deception and manipulation surrounding the US entry into the war, had also prepared a number of signs challenging the Bush administration’s actions. Once the crosses were in place, however, an event critical to the future of Arlington West occurred. 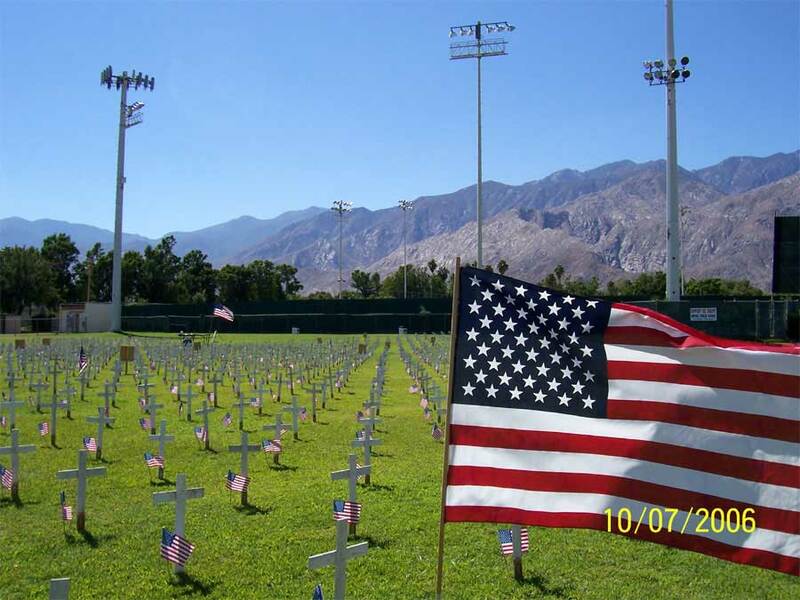 The group, mostly veterans, that had placed the crosses paused and looked at what they had created. It was a memorial, not a protest. All the signs went back into the truck. We had created a place too sacred for more acrimony. Fresh grief blended with old griefs. We relearned that new wars scratch open old wounds. Month after month, for the next few years, SDVFP recreated Arlington West on the beach at Oceanside. The memorial was visited, first by large numbers of Marines facing their first deployment, then by returning veterans looking for the names of their friends. Families came to grieve. Older vets came to pay tribute to the newly fallen, as well as to comrades they lost decades ago. As the number of names and crosses grew from three hundred or so to over four thousand, logistics grew difficult. It required many volunteers, working many hours to make crosses, paint them, compile lists, put on names, transport crosses, repair them, and much more. Set up required a large crew and several hours. SDVFP could not have done it without the loving labor of many other vets, and civilian volunteers as well. We are especially grateful to the many active duty Marines from Camp Pendleton who helped. The memorial was eventually installed in many other places as well, parks, campuses, and other beaches, always to a warm reception, but Oceanside remained, in some way, the central focus. As a group and as individuals, we learned that grief is a powerful force. Setting up Arlington West, and going to it, was a bit like attending a family funeral—over and over again. It was grueling, and individual members dealt with that in different ways. Not doing it was just not an option. Grief, unlike anger, is a uniter, and accompanying a comrade, a mother, a wife, a fiancée at the memorial was a privilege, every single time. Political divisions became, for the moment irrelevant. America was, in one small place, for one short time, united again, in our grief at the price of war. We learned that the military community and the peace community have more in common than anyone thought, and we learned that VFP is part of both. At public events in San Diego, VFP has often occupied the no-mans-land between peace activists and the military. This was also true, at first, on the beach in Oceanside. Arlington West brought peace activists and the military together, often for the first time for the individuals involved. Opposition to the memorial was almost non-existent from the start, and what wariness people brought to the experience usually vanished immediately in shared grief and shared work. For active duty and other veterans, it was clearly moving to see that those opposing war, were in many cases veterans themselves. One memorable evening a bugler in USMC dress blues showed up at sunset to play taps for us, sent by the officer of the day at Camp Pendleton. A few times, angry would-be antiwar protesters threatened this détente, and it fell to VFP to insist that the event remain a memorial. We found ourselves gently calling peace activists back to their own best selves. Perhaps one of the most important effects of Arlington West has been to make the peace movement in San Diego more focused, effective and compassionate in dealing with those in the military. The service men and women who attended Arlington West frequently needed us, especially after their first deployments. Like generations of veterans before, they were finding that they now live in a world different from that of their friends and family who stayed behind, and that talking about their experiences with those people can be difficult. Often, we would stand silently with a returning warrior while he or she stared out to sea. Sometimes that was all we did. Sometimes they would then begin talking to their fellow veterans like they could talk to noone else. Arlington West was a temporary refuge for them. The myriad stories from Arlington West have lives of their own— touching, unique, and yet universal. Many are too private to write down, but have been etched in our hearts. I have often thought, at sunset, looking over the field of crosses and the soft glow of row after row of candles, how much I wished that each of those named on the crosses could be present in the flesh instead. Watching the surfers running into the waves between the rows of crosses and the sunset sky, or the beautiful girls walking arm in arm down the beach, laughing always made this loss more poignant. Life is precious. We cannot forget what this war has cost us. Click to read a brief chronology of the Arlington West Memorial.